As we leave summer behind and get ready for fall, I look forward to the cooler, frostier weather of my region. Cold air wakes me up and makes me feel energetic and alive. 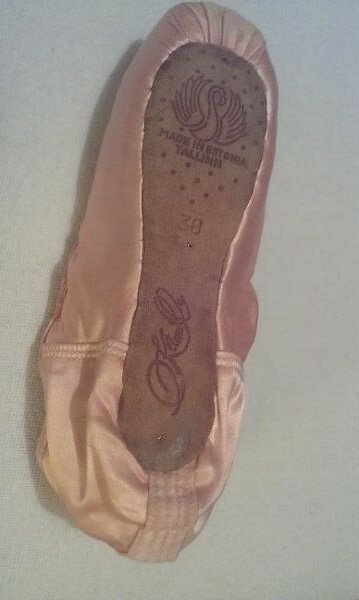 Energy is a great thing to have when you are trying to solve numerous shoe puzzles and figure out mysterious pointe shoe brands like the one on this page. The model is called Annette. The manufacturers stamp under the toe box says Made In Estonia Tallinn*. It’s clearly visible and easy to read because of the block lettering. * If you want to know more about this part of the world, see : Tallinn, Estonia. Asking For Fresh Eyes And Reader Opinions-What Does It Spell Out To You? This imprint is the brand name needed to do further research on this manufacturer. Although the imprint under the toe box is easy to make out, the writing under the heel portion has driven me to distraction. I zoomed and zoomed in, but I cannot make out the full name. Can you? I see an O, a K and a possible A, but cannot decipher the rest. Does it appear to you that the first O shape is part of the swirly K? I could definitely use a set of fresh eyes ( and younger ones) to help make this out and get the puzzle solved. I am looking forward to your thoughts and opinions! Update: Thanks to some effective Facebook sharing, I learned that the brand is Kamilla of Estonia. It appears that the Annette might be discontinued because it isn’t featured on their website, Kamilla.ee. I sent an inquiry to Kamilla about the Annette and hope to learn more. I am a bit disappointed that this brand cannot be added to the sidebar, but so happy to finally know what the brand is. 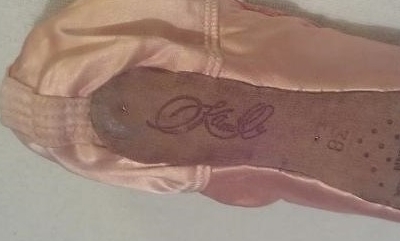 This entry was posted in Estonian Brands, Mystery Pointe Shoe Brands and tagged Annette pointe shoes, Estonian pointe shoe brands, Kamilla Annette pointe shoes, Kamilla pointe shoes, mystery pointe shoes, pointe shoes made in Estonia. Bookmark the permalink. I will share this on my facebook page and maybe someone will recognise it. Sorry this is not about the current shoes, but i just wanted to say that i just found your blog and love it! I was also wondering, what are the shoes featured in the picturefor your banner? Thank you so much, and great blog! Thanks for visiting, Abby. I’m glad you like it. Unfortunately, I have no idea what brand or model the shoe is on the banner. It looks like a canvas practice shoe; well-worn and loved by the dancer.